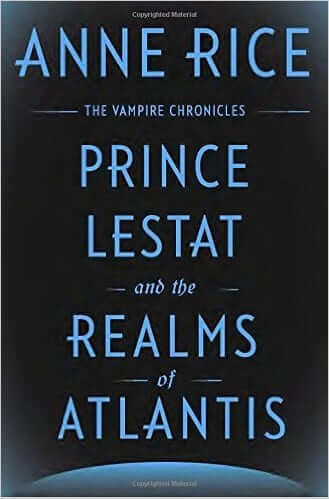 Having been a huge fan of the Brat Prince and various vampire adventures in Anne Rice’s fictional realm of vampires, witches and spirits, I was pretty excited to learn that she was picking up the pen for another novel: Prince Lestat and the Realms of Atlantis: The Vampire Chronicles. The new novel emerged from coffin this week and, well, it changes everything! This novel marks the twelfth in the “Chronicles” (Pandora and Vittorio, though part of the same realm, fall under the “New Tales of the Vampires” series). Lestat de Lioncourt first burst onto the scene and ‘modern’ times in the 1976 novel “Interview with a Vampire”. This first chapter in the saga and the two subsequent stories, The Vampire Lestat (1985) and The Queen of the Damned (1988) also made the leap into theaters. The first film, Interview with a Vampire, starred Tom Cruise and Brad Pitt and mainly focused on the first book in 1994. Books two and three were somewhat combined into the less than stellar 2002 film, Queen of the Damned, which featured Stuart Townsend as the blond vampire (a role that Anne Rice first envisioned being played by singer Sting). Nine more novels followed and additional crossover material was featured in the Lives of the Mayfair Witches series – blending the two series into one realm. The latest of the series, a follow up to 2014’s Prince Lestat, is making waves (pun intended) over the Atlantis story element (and all that goes along with that). Tying the story to characters in her third book, Queen of the Damned, Rice completely upends the myths and lore woven into the Chronicles (almost to the point of jumping the shark IMHO). The characters we love, like Lestat, Louis, Armand and others are still who they are, yet the surprises tucked into Prince Lestat and the Realms of Atlantis feel like they cheapen the fabric of the series’ mythos. According to a recent interview with io9, Rice delves into the reasons for the game-changing plot twists in her latest story. Keeping this article spoiler free (especially as the book was just released this week), we’ll save those details for those who read the book (or who are not concerned with spoilers and would like to read the interview here). Finally there is some additional, exciting news from Anne Rice (and perhaps the better of the two items making the rounds this month) as she announced on Facebook this past Saturday that she had reacquired the film/TV rights to the Vampire Chronicles. “A television series of the highest quality is now my dream for Lestat, Louis, Armand, Marius and the entire tribe. In this new Golden Age of television, such a series is THE way to let the entire story of the vampires unfold,” – Anne Rice on Facebook. Seek help, before we ITM Disney fans seek it for you. It is a very helpful post. This post is related with the sink your fangs into news from the world of Anne Rice and the vampire chronicles.